document are trademarks of Groupee, Inc. Welcome to the UBB.classic™ Community! he UBB.classic™ software is one of the easiest web-based message boards to use. Its familiar interface can be found on more than 300,000 Web sites worldwide. This guide will offer you a tour of the various interfaces you will encounter, explain how to use each of the features, and allow you to jump right into the community. The UBB.classic™ community is all about participation and interaction, so you’ll find that most features are readily accessible. Registration – Most UBB.classic™ communities require that you register before you can read or post messages. Completing the user registration form (which becomes your profile), normally will grant you access to read messages, start topics, and post replies. Your Profile – At any point, you can click on the “my profile” link to reach the page where you can change the information you provided at registration. This is useful if you wish to change your display name or any of the optional information about yourself. Most of the profile information is visible to all members of the UBB.classic™ community to which you are registered, so don’t enter any information you’re uncomfortable with sharing. How to Contact the Administrator or Moderator – We hope you enjoy your experience. If you encounter difficulties while using a UBB.classic™ community, you can first contact the forum moderator or administrator (there is usually a “contact us” link at the bottom of the page for this purpose, or you can click on the person’s e-mail link in the interface). The community owner/administrator can also contact Groupee directly for technical assistance, if necessary. Think of it as the modern version of the city marketplace, with people gathering to talk about their personal lives, purchase goods, recommend things to friends, ask questions of the merchants, and compare notes. And just as in the city market, each vendor has the chance to make his/her display unique! Once you reach the community, the software has an internal structure that makes it easy to follow. Category – A number of forums that have been grouped and given a name. Categories are the “organizers” of the UBB.classic™ community’s top-level structure. Some communities don’t use Categories, in which case all of the forums appear on the main page together. Forum – An area created by the board administrator in which members can start conversations on various subjects (topics). The board administrator usually provides a forum name and description that tell you what general subjects should be discussed in that area. What do those light bulbs mean? The UBB.classic™ software keeps track of which forums contain posts that are new since the last time you visited. When the light bulb is “on,” there are new messages. When the light bulb is “off,” there are no new messages. Topic – A conversational “thread,” with an initial message kicking off the conversation, followed by a series of replies. It’s polite to make sure your new topic fits the subject area of the forum in which you’re posting. Message, or Post – A piece of information you wish to share with the rest of the community. A new message can be the start of a new topic, or it can be a reply to an existing topic that someone else created. You have the chance to edit and/or delete your message within a certain period of time, if you make a mistake. Reply – A message posted in response to a topic started by another member. FAQ – Frequently asked questions is a compilation of helpful answers to commonly asked questions about the UBB.classic™ software. If you get lost, the FAQ link is a good place to start looking for an answer. My Profile – This page displays user ratings (if enabled) and your private messages. It also gives you access to your personal information, entered when you first registered for this community. Your particular board administrator may have customized this form so that you can share information of interest to this community; for example, your favorite baseball team. You can modify this information at any time, by clicking the link. Administrator – This is the name for the person who runs the message board, responsible for how it looks, how it is organized, and what the overall rules are. Generally, the Administrator also monitors the activities of the forum moderators. Moderator – This is the name for the person or people who run a specific forum, responsible for keeping the conversation on-topic, offering assistance to new members, and sparking conversation. The moderator can also post special rules for his/her forum or make announcements. Recent Visitors – This feature is what shows you who is either currently viewing the forums, or has recently been visiting. The list of recent visitors can appear at the top or bottom of the forum pages. Private Message – You can send and receive messages that do not appear on the actual forums. A private message is accessible strictly to the person sending and the person receiving it. Post Preview – If you want to give your message one last look before posting it on the message board, click the post preview option. You can review the message and make corrections before anyone sees it! Click “New Topic” to start your own new topic. Be sure to include a Topic title. You can also include a posting icon if you wish to convey a mood with your message. At this time, you can also check a box to have all replies sent to your email address, or check a box to preview your post. When you are finished, click “Post Now” to complete the process. To reply to a topic quickly, scroll to the bottom of the page, and type your reply in the “Quick Reply” box. Use the Instant Graemlins link to add Graemlins (smilies) to your message. If you would like to use advanced posting features, like subscribing to the topic, or Instant UBBCode™ option, click the “Full Reply Form” button. Note that the “Quick Reply” box can be enabled or disabled by the Admin, so it may not appear. If there is no reply tool, that means that replies are not permitted in that particular forum. If you notice an error in the message you have posted, and you wish to change it, you can edit your own post by clicking this icon , which appears inside each message. On the next page, you create your poll questions and determine the answer format. Click “Continue” again. On the next page, you write the possible answers, and click “Continue.” If you have selected “Advanced Options,” you will see a screen with options for start and stop date and time, as well as when the results may be viewed and whether the results may be viewed by non-voters. Note that you can choose any, all, or none of the Advanced Options. At the end of the process, you get a chance to review and/or edit your poll before it is posted. If your poll is ready, click the “Post” button. Note that polls are just like any other topic, and can be replied to. If you see that someone has posted a poll, and you wish to participate, simply click the “Vote Now” button and add your responses. Note that permission to participate in polls is set by the Admin and can differ from forum to forum. To view the poll results, click the “Results” button. The poll can be set so that you cannot view the results until the polling period is over, and/or so that non-voters cannot view the results. In any topic, you’ll see UBBFriend: Email this page to someone! If you click this link, you can send the topic to one or more friends via email. You have the opportunity to add a personal message to the beginning of the message as well. See all active topics for the day by clicking “Today’s Active Topics.” You’ll see a compiled list of all topics with posting activity in the last 24 hours, in chronological order. If you are the person who started the topic, you can opt to receive all replies via email when you first create the post. If you are a participant in the topic, you can check the “Email Notification” box on the full reply form. You will then receive an email notification whenever someone replies to that topic. You can also subscribe to a topic in which you’ve participated by clicking the “edit post” icon within your reply, then checking the “Email Notification” box. Notice the “Recent Visitors” box at the top or bottom of the page? If you click that link, you’ll see a list of which users have logged into the community recently, and where they are (or were). Note that users who have opted out of this feature will not be shown. If you click the board name, you can see a popularity summary across all forums; if you click the forum name, you can see detailed forum visitor statistics. If you see a post that you believe requires immediate attention from a moderator or Administrator, click this icon: . You can then write a brief note that will go with the email alert, so that you can explain why you are reporting the post. The alert goes by default to the forum moderator(s); if there is no designated moderator, it will go to the Administrator of the board. One of the key benefits of the discussion board format is that it enables commonly asked questions to be answered once, for the benefit of all. Before posting your question, it is always worth checking to see if it has already been asked - and answered! You can do this via the Search link on the top navigation bar. Various options are available, both for how the search term is specified and for controlling which forums you want to search. The community directory allows you to browse or search the entire member list of the community. Simply click the “directory” link at the top right of any page, and you’ll see options to browse by member number, display name, or number of posts. If the community owner has enabled it, you may also be able to search the member list by keyword or by member status (for example, if you wanted to see the names of all moderators). On the community directory page, you may also see some fun statistical information, like recent new members, top posters, or a “member of the moment”. You can edit the information in your profile at any time (this is the information you provided at registration). Simply click the “my profile” link; this opens an entry page with your ratings and private messages. Click “edit profile” to make changes to items like your password, email address, location, etc. You can also use this page to view your recent posts, edit topic notifications, and review the User Agreement for this board. Click the My Profile link, then click Edit Profile. Scroll down to the field called “Avatar Image.” Click the link to see the avatars that are available for you to choose from. The owner of the UBB.classic you’re using may also allow you to use a custom avatar. If so, you will see a field called “Use Custom URL” in the avatar popup. Simply type in the URL to your image (it must be accessible via URL; you cannot type in the path to a file on your own computer) and click “Set URL”. You can change your avatar at any time using this same process. What the heck is an Avatar? An avatar is a graphic representation of you. It can be a photo, a cartoon, or some other image file that you choose. Usually, they are small (UBB.classic prefers 65x65 pixels) and show up when you post to the message board. Avatars are not restricted to just message boards, however; many online games and communication software allow you to use an avatar, or graphic image, to represent your presence. You can add a person to your Ignore or Buddy List by accessing the person's profile or on the private message page for a particular message. You may remove people from your Ignore or Buddy List by un-checking the boxes next to the names. Use the Buddy List for people you anticipate sending frequent private messages. It is a handy way of reaching all of your buddies from one compiled list. Use the Ignore List for people you do not wish to receive private messages from. Ignore lists have no use for anything other than private messages. You can click on the icon within any message to send a Private Message to the author. How do I know when I have a private message? If you see a flashing envelope at the top of the screen, you’ll know that you have an unread private message waiting. Just click the envelope icon, and you’ll be able to read your private messages. Look for Printer-friendly view of this topic at the bottom of any thread. If you click the link, a new window will open that contains a stripped-down version of the thread content. Use your browser’s print function to print this version. You cannot rate yourself, but if you click on the “Rate Member” hyperlink that appears in each post, you can use the “Rate Member” box to express your opinion. These are permanent, so make sure you really mean it! In order to add an image to your message or your signature, you must have the image already available on a web server. This can be an image on your own personal web page, for example. To place an image within a message, simply click the “Image” UBBCode button, and place the URL to the image in the popup box. You can have all of the times on the message board appear in your own local time. To set your timezone display preference, click “My Profile”, then select “Edit Profile”. Scroll down to set a time adjustment, select a preferred date format, and select a preferred time format. If you do not select a preference, the Admin’s default preference will be shown. Click this icon to see the author of this message’s profile information. View author’s home page (if they have provided one). Click this icon to send an email to the author of this message (if the author has made his/her email address publicly accessible). Click this icon to send a Private Message to the author of this message. Click this icon to edit or delete this message (you can only use this feature if you are the author of the message or an Administrator/Moderator). Click this icon to alert the moderator to this particular post. You will have the opportunity to customize a message explaining why you are reporting the post. You may only use the Close Topic, Move Topic, or Delete Topic links if you are an Administrator or Moderator in this forum. You may only use this if you are an Administrator or Moderator in this forum. A “featured” topic is one that remains at the top of the topic listing regardless of posting activity, like a news item or an announcement. What is a UBBCode™ tag? UBBCode™ tags allow you to add formatting (bold, italics) and other information (emails, URLs) to your messages without learning HTML! Groupee is the originator of this simplified markup for message board posts. Although they are called UBBCode™ tags, they work the same way whether you are using UBBclassic™ software or the OpenTopic™ application. Why use UBBCode™ tags rather than HTML? · They allow you to add formatting to your posts even when the administrator has disabled HTML. · If you use a UBBCode™ tag incorrectly, you can’t break anything (unlike HTML, which can result in errors). · They are much easier to learn than HTML. How do I use UBBCode™ tags? 1. Type the actual tags into your message. 2. Click on one of the Instant UBBCode™ buttons within the posting interface. Whichever method you use, the formatting will be applied when you submit your message. What can I do with UBBCode™ tags? The following is a list of current UBBCode™ tags and their functions, with examples. You can use the list tags (or Instant UBBCode™ button) to create several different types of lists: bulleted, numbered, lettered (with capitals), and lettered (with lowercase). Start each list item with [*]. There is no end tag necessary. a. This is the first item. b. This is the second item. You can reference something specific that has been posted by copying and pasting the text within the [quote] tags or using the Instant UBBCode™ “quote” button. The software will automatically block and indent the text to set it apart from the rest of your message. It’s easiest to copy the text you wish to quote before you open the “post reply” or “new topic” box. 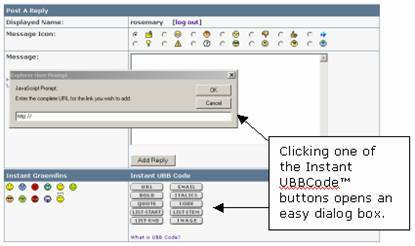 This tag (or Instant UBBCode™ button) allows you to preserve the formatting of programming code within your message. Similar to the [quote] tag, it automatically blocks and indents the information. All formatting is preserved within the tags, and HTML, UBBCode, and Graemlins are disabled. No tag necessary for this one! The software recognizes URLs when you type them. If you need a little help, you can use the Instant UBBCode™ button that says “URL” to get you started. You must type in one of the following prefixes with the address: http://, https://, www, or ftp. Linked URLs will open in a new window when someone clicks on them. Do not use quotation marks within the URL tag. If you use this tag (or Instant UBBCode™ button), the email address you type will be automatically hyperlinked within your message. If you use this tag (or Instant UBBCode™ button), the image you type will automatically appear within your message. You must include the http:// portion of the URL for this code to work properly. Note that some Web sites disable this tag. Do not use HTML and UBBCode™ tags to perform the same function in the same message. UBBCode™ tags are not case-sensitive (thus, you could use either [url] or [URL]). Do not put spaces between the bracketed code and the text to which you are applying the code. You must use the UBBCode™ tags in pairs---each must have a start and end tag in order to function correctly.